Recently, GN Solids Control has delivered a new set of solidificaiton unit to a client who has the reqeust to give a finanl and satisified treatment of drilling cuttings. Based on GN standard model of GNGH Solidificaiton unit and end user’s new ideas and jobsite condition, GN team designed a new customized solidificaiton unit. 1. 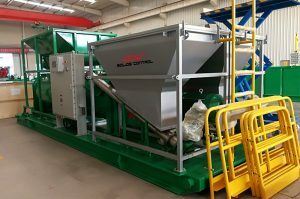 In order to save space and easy for transportation, this new solidficaton unit uses a smaller feeding hopper for raw material, and its layout is different from before. It’s located just directly over the cylinder sized mixing tank. 2. PLC smart touching screen with 3 VFD’s for easy operation and precise adjustment for feeding speed and capacity. GNGH has 2 different models, one VFD controlled without PLC, the other is fixed speed. 3. An electrically operated valve is added to the discharge port below the mixer, this valve could be set to run automatically or under manual operation. It enables the operator to control the mixing output by adjusting the mixing time. 4. Besides those, there are two additional auxilary equipment are provided to work in a set for this system, one is hydraulic lifting platform for jacking up the feeding chemicals and cement onto the chemical and cement hoppers. 5. Th other eqiupemnt for as auxilary equipment is a belt conveyor whose feeding hoppre is below the mixing tank discharge, precisely below the electrical valve, for collecting discharges and transfer to cuttings container. This system could do solidification continuously and discharge continuously.